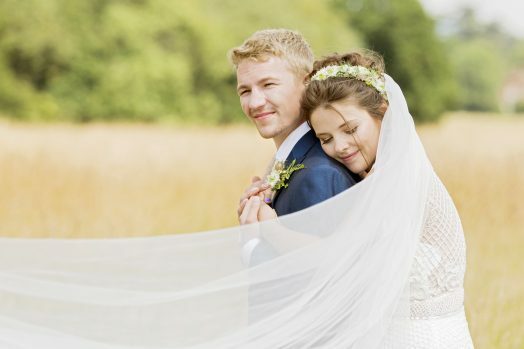 Wedding season is sadly coming to an end, and wow what a busy Summer we have had this year! 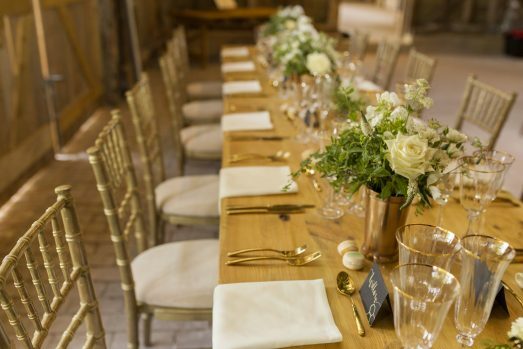 I think we can all agree that two of the most popular themes this year, have got to of been Rustic and Gold. 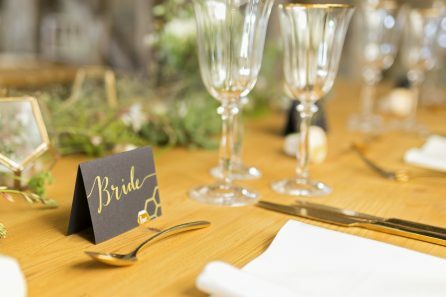 Rustic is great as you can dress this up or down and goes with just about anything, and Gold is so elegant and adds such a beautiful touch. 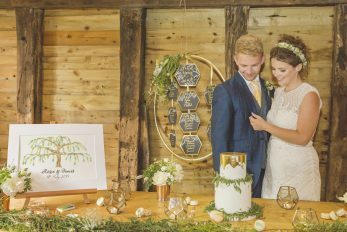 Together with Bower Events, we thought it would be a fantastic idea to incorporate both of these into our High Billinghurst Farm photoshoot, ‘Rustic Meets Gold’. 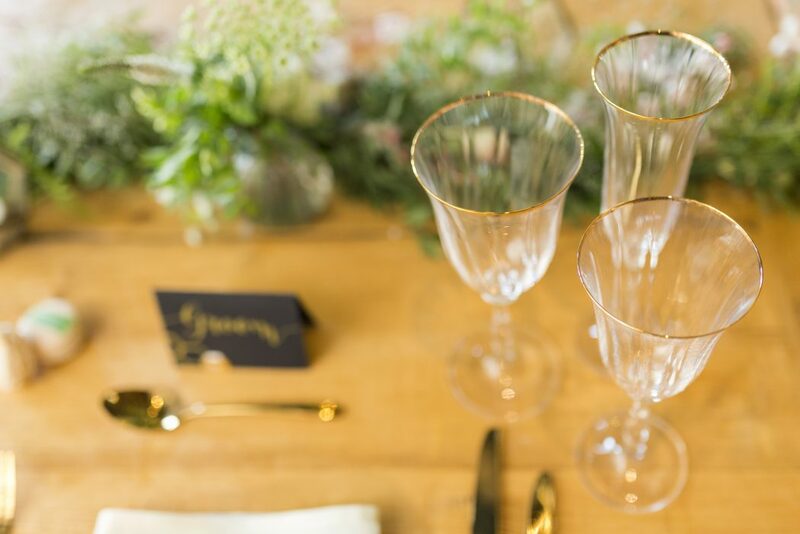 To create the Rustic meets Gold theme we used our gorgeous Rustic tables, Goldwash Chiavari chairs, Gold cutlery, Gold Rimmed glasses and Ivory napkins. 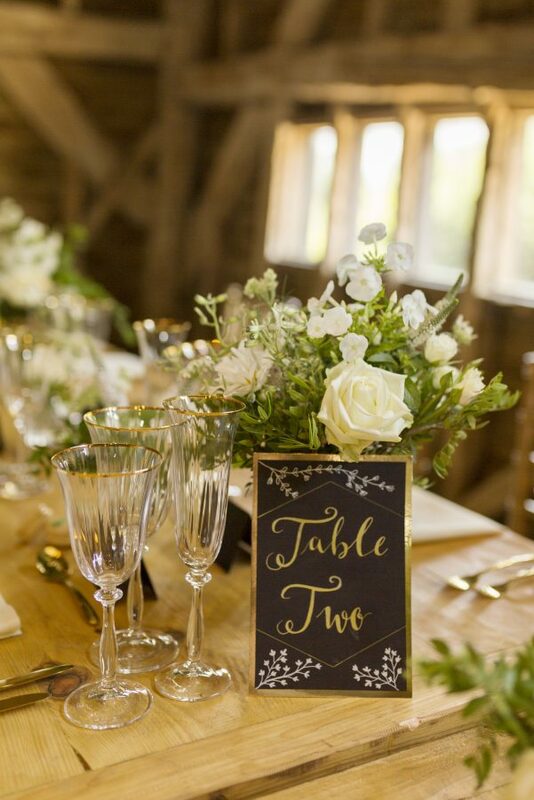 Amy Verse added a lovely touch with her stunning, unique, Black and Gold name cards/table numbers and To Have and To Hire dressed the room beautifully with their Green Foliage on the beams, Fairy Lights draped across the middle and their Giant Wooden Heart in the centre. 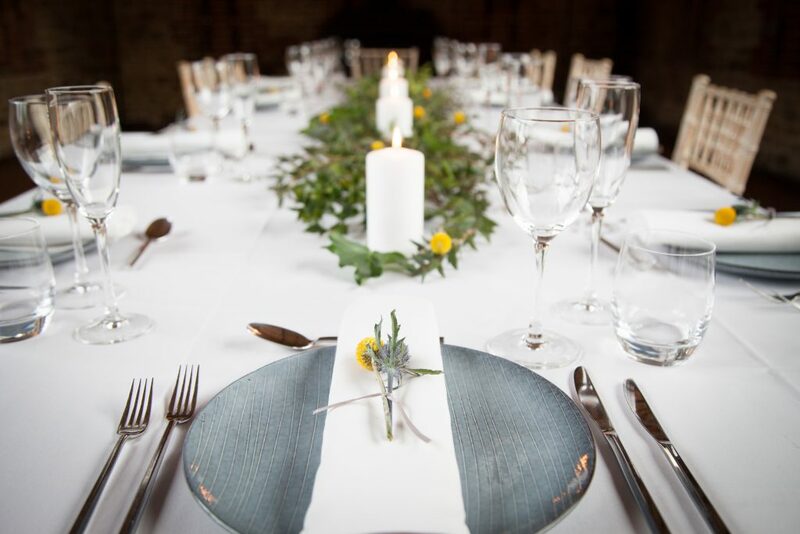 For the top table, Angel Like Flowers provided a lovely, long garland which ran down the table and this was made up of Astrantia, Nigella, Ferns and Spirea which is also known as ‘Love in the mist’. 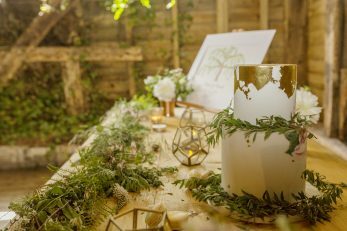 There were also some small, dainty, dancing flower pots surrounding this to create a woodland feel. 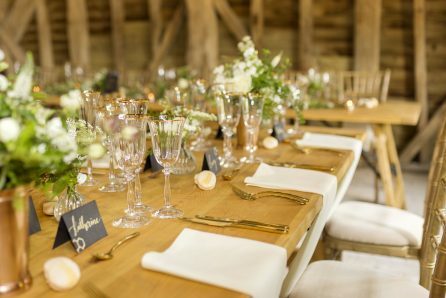 On the other tables there were some larger flower pots consisting of White Naomi Roses and Duchesse de Nemours Peonies, which were placed down the centre of the table. Angel Like Flowers really helped tie the overall look together. 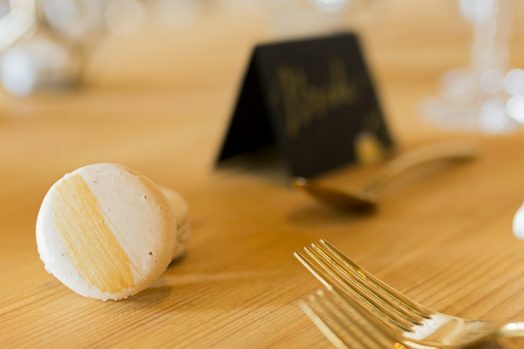 Julien Plumart supplied some delicious coconut macaroons, which were used as little favours on the table. These were sprayed a stunning gold/green colour and looked so pretty. It is so important to think about the small details as these make a huge difference to the final appearance. 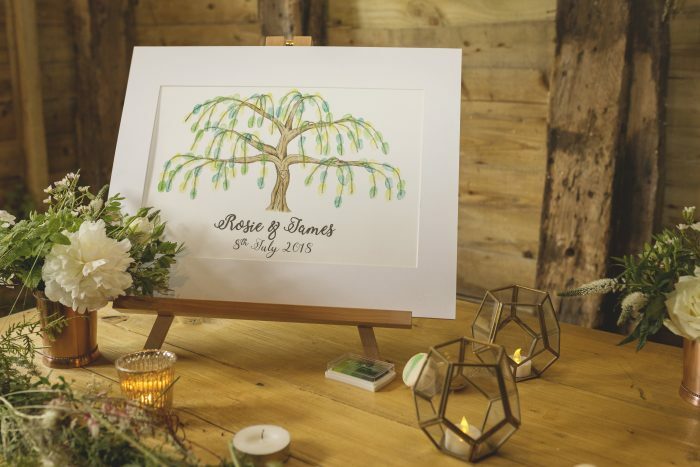 If you are looking for an alternative guest book idea then you must check out the Fabulous Fingerprint Company! 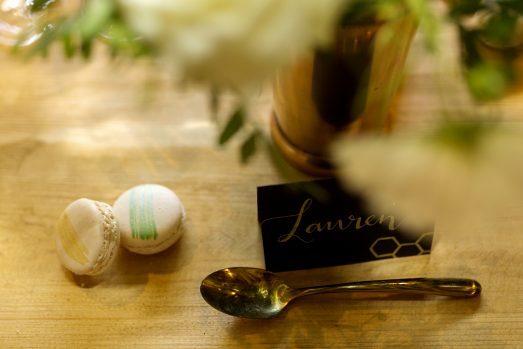 They hand draw/paint your design and all your guests mark their fingerprint on it. What a fabulous idea! Oh and not to mention The Pudding Fairy for their incredible cake! 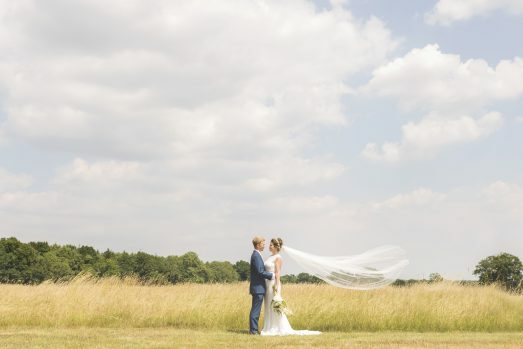 High Billinghurst Farm is a beautiful Wedding Venue which is set within 65 acres of the wonderful Surrey countryside. 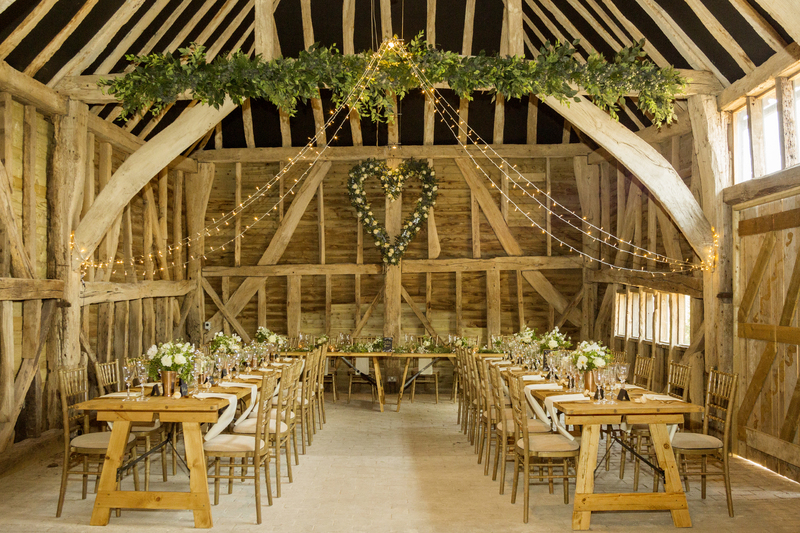 Not only does it have the gorgeous barns, but it also has plenty of space for a marquee too. 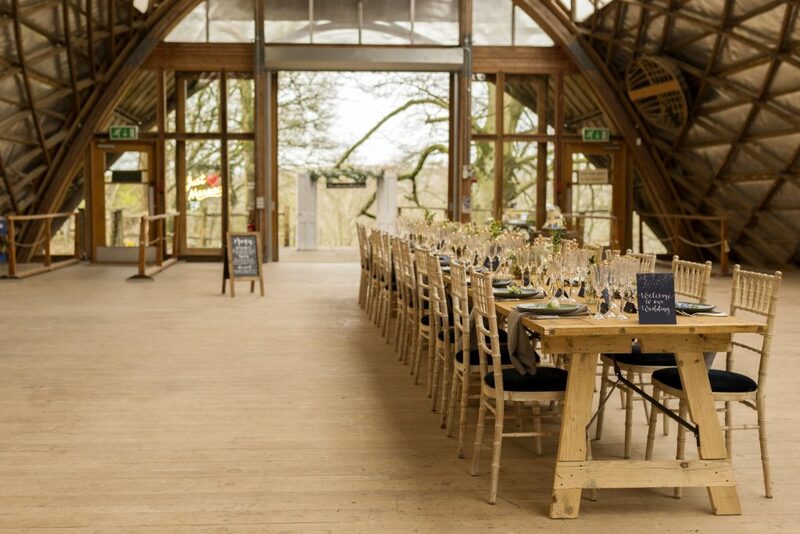 This venue is definitely one to consider when planning your Big Day! 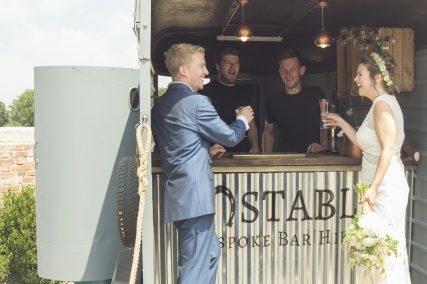 The Unstable Bar made great use of the courtyard with their Horsebox Bar, serving delicious cocktails and drinks! 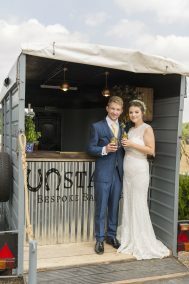 As you can see, our Bride and Groom really enjoyed these! 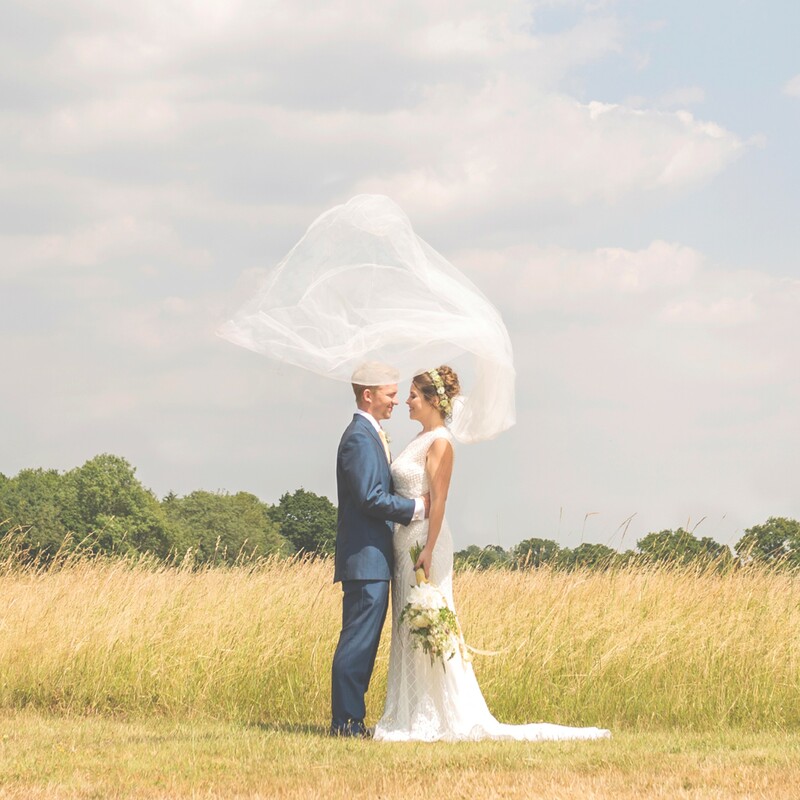 We love Opulence & Grace‘s gorgeous dress and suit for our models Rosie and James. 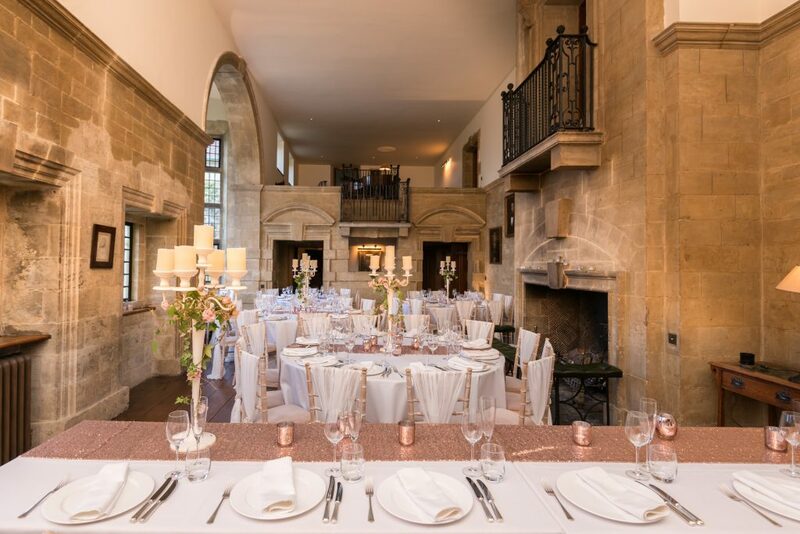 The long vale looked incredible and completed the look. Becky Howie MUA and Your Event Stylist Sammie did a flawless job with their make up and hair. 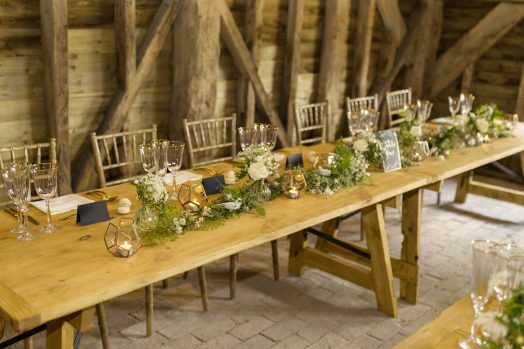 We hope you enjoyed reading our ‘Rustic Meets Gold’ blog post. 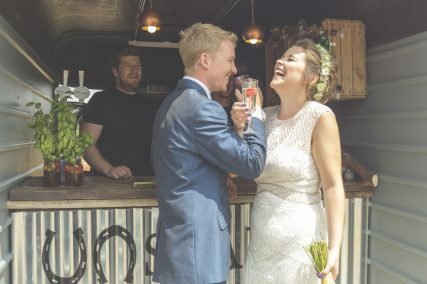 We would like to say a huge thank you to all of the talented suppliers who were involved in this photoshoot, and to Bower Events who helped organise it! 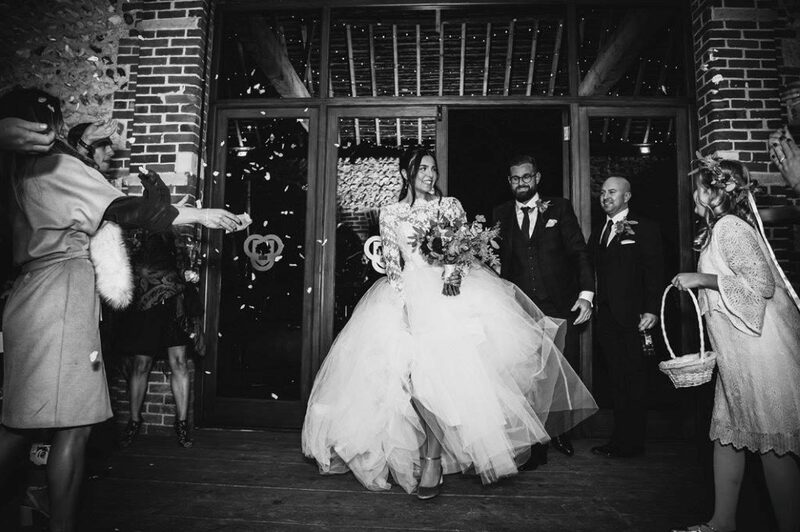 Make sure you check them all out and contact them for your Big Day/Event! 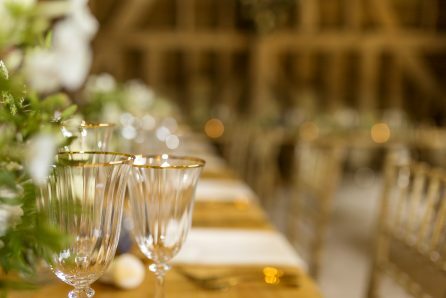 Place Settings Catering & Event Hire are here to help and assist if needed, and would love to supply for your event. 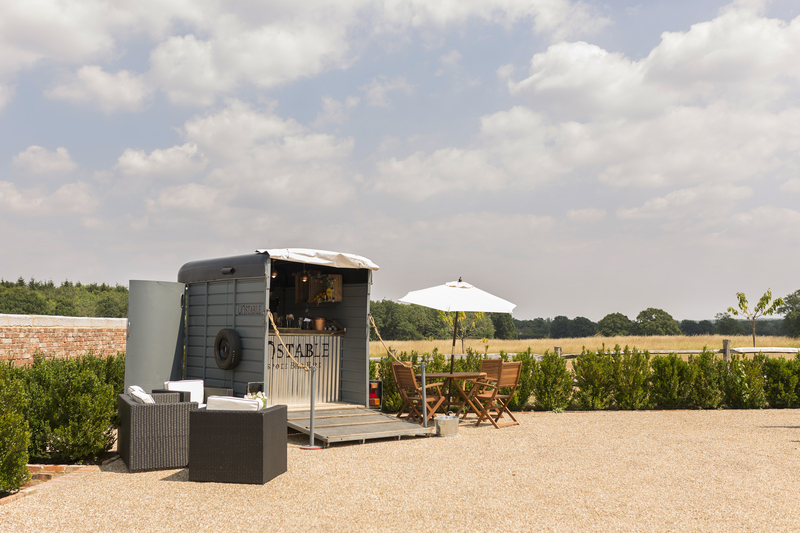 Have a browse through our website and contact us for a quotation today! 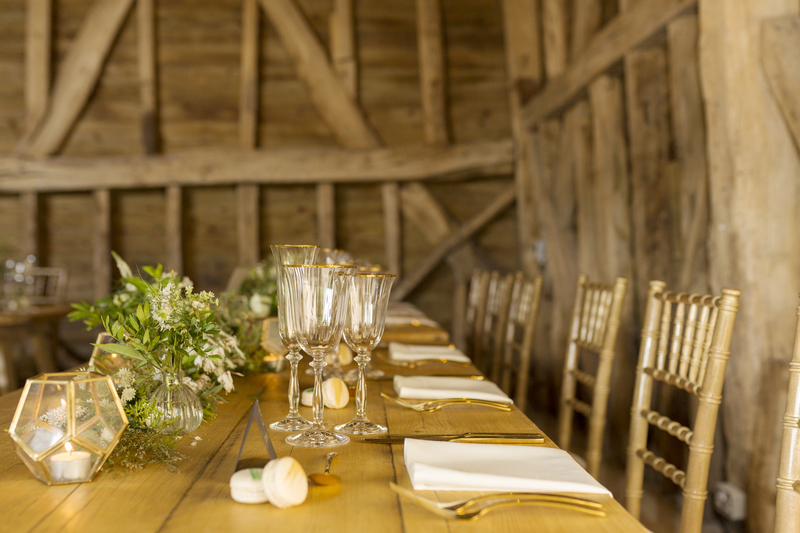 Your Sussex Wedding Magazine are featuring this shoot in their Dec/Jan issue, with lots more exciting, unseen photos! Don’t miss out, grab a copy and take a look!